Pictured above: SD42 Grade 4 students were all smiles after receiving their new illustrated dictionaries. 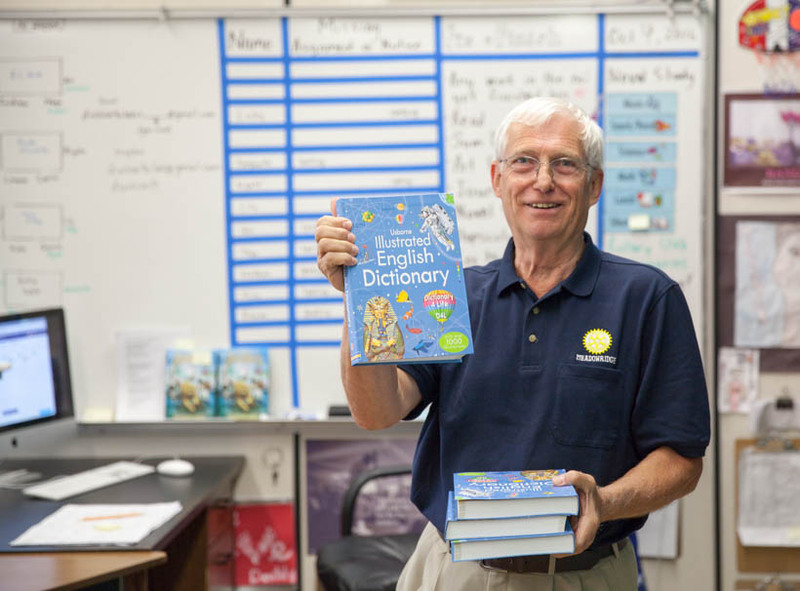 Earlier this month, the Rotary Club of Meadow Ridge began delivering 1,050 brand-new illustrated dictionaries to Grade 4 classrooms across the Maple Ridge – Pitt Meadows School District. The Usborne dictionaries contain more than 10,000 entries and thousands of colour illustrations. Every Grade 4 student in SD42 will receive a dictionary and there is no cost to parents or schools for the books. Matt DeBruyn of the Rotary Club of Meadow Ridge. The Rotary Club of Meadow Ridge is a longtime supporter of SD42 schools, providing scholarships and fundraising for school facilities and educational tools, such as playgrounds, sports fields and musical instruments. The latest literacy project was inspired by Rotary International’s Dictionary 4 Life initiative. DeBruyn says the club is committed to running the dictionary project for at least three years, starting with the 2016/17 school year.